Today, Alzheimer's disease — the most common form of dementia — is one of the leading causes of death in the United States. As the population's average age slowly rises, the number of deaths due to dementia is likely to increase in line. Despite this, catching dementia early remains challenging. Oxford Brain Diagnostics believe that their technology can find the condition years before symptoms become apparent. Their secret lies in cortical disarray measurement (CDM). In short, this technique enables scientists to gather an "extra level of detail" from existing MRI scans. This allows them to detect changes in the microanatomy of the brain. Dr. Steven Chance — Oxford Brain Diagnostics' CEO — told MNT that "CDM extracts information about the microscopic structure of the brain's gray matter by applying a unique analysis to a standard form of MRI scan." "The method reveals the damage to the cerebral cortex even in the early stages of disease because it is sensitive to disruption at the cellular scale." Alongside the obvious benefits of spotting the signs of dementia earlier, the technology might also assist the pharmaceutical industry: Researchers could quantify how experimental drugs affect the microstructure of the brain. Healthcare has always been about the patient, of course. However, in recent years, there has been an increasing push to involve the patient more deeply. Mainly, there has been discussion around how doctors store our data, who keeps them, and how they are shared. "Medical chain enables the user to give healthcare professionals access to their health data. The medical chain then records interactions with [these] data in an auditable, transparent, and secure way on Medicalchain's distributed ledger." This technology, the company believes, would empower the patient. Also, as online consultations become more popular, this technology would help overcome some of their inherent privacy and security issues. The company hopes that soon, their services could be open to the public at large. In 2018, globally, there were 570,000 new cases of cervical cancer. Around 90 percent of deaths from cervical cancer occur in low- and middle-income societies. Better screening and earlier intervention could significantly reduce the mortality rate. MobileODT has designed a battery-powered, hand-held colposcope called the EVA System, which can take high-quality images of the cervix. MobileODT worked with the National Cancer Institute to develop a machine learning algorithm, called automatic visual evaluation (AVE), that can produce an accurate diagnosis in minutes. A prospective, multicenter pilot study that scientists conducted in Korea showed that the device is more than 90 percent accurate. Yael Misrahi — head of global partnerships at MobileODT — outlined the product at Future Healthcare. MNT caught up with her after the event, and she explained that one of the primary benefits of this system is that "it is handheld and can be used by a non-expert healthcare provider." Because the device is based on smartphone technology, it is user-friendly and includes a "remote consultation feature to consult experts either in real-time or during a quality assurance check." "[W]ith AVE — the machine learning algorithm for detection of pre-cancer — there is no need for a scrape or a lab and a woman can receive a result at the point of care rather than waiting several weeks or months for a result." How batteries work has remained relatively unchanged for decades. BlueThink — without altering the underlying chemistry — have developed a way of making a common type of cell safer and more cost-effective. BlueThink's battery is compact, constructed merely, flexible, and safe. "Medical devices are now smarter and more user-friendly than ever before." "This growing trend relies on good design and the use of technologies like LEDs and screens to improve the user experience, as well as connectivity to provide patients, doctors, and healthcare systems with valuable data." "All these innovative devices have one thing in common: They need energy." Button batteries are not without their problems; if a person leaves them on a shelf for a long time, they lose their charge. If they are incinerated — for instance, those of contaminated disposable medical equipment — they explode. They are also harmful to the environment and a significant hazard for children if swallowed. According to BlueThink, they have found a way to mitigate all of the above. Using standard battery technology but with a twist, they have created a flexible battery that a child could safely swallow, that does not explode when incinerated, and that keeps its charge when left on a shelf. Importantly, it is also low-cost and producible in large quantities. Nadal told MNT that "[a] small amount of energy can make a big difference in a medical device, but it must not compromise user experience, safety, or sustainability." Loneliness is a real, increasing issue in the U.S. and globally. Many healthcare professionals now recognize loneliness as a risk factor for many medical conditions, including cardiovascular disease. Genie Connect promises to combat loneliness. For this reason, we need to address loneliness with urgency. Service Robotics Limited have recently created an innovative solution that aims to bridge this gap. Genie Connect is a friendly looking miniature robot. The designers described it as "a companion robot service that uses a friendly, intuitive, voice-enabled robot to offer connectivity and support [...] older adults." It can carry out commands in a similar way to other favorite virtual assistants, but it has a range of bespoke, customizable features. Genie Connect can have a conversation and set up video chats with healthcare professionals and family members. Service Robotics Limited designed it to help stimulate and engage the user's mind. It also reminds the user when to take medication and attend appointments. There is a common concern that robots will take away the jobs of humans; in this case, Genie Connect fills a gap that humans currently leave open. Perhaps the most unusual device we saw at Future Healthcare 2019 was called SoeMac. According to its creators, "SoeMac alternative therapy creates energized oxygen, which your body can safely use to help restore itself at night while you sleep." SoeMac is a small, rectangular device that gently whirrs. A user switches it on and leaves it by their bed at night. According to the designers, it helps us breathe more easily and sleep better. They say that "it works by drawing air inside and producing a bio-usable form of energized oxygen, known as Singlet Oxygen Energy, or SOE." "This can help your body to carry out essential restorative work while you sleep at night, boosting the effectiveness of your nighttime detoxification and bodily repair functions." It is crucial to note that so far, no clinical trials back up these claims. However, SoeMac's creators are planning studies soon. In particular, they hope that it might give relief to people with a chronic obstructive pulmonary disease. Overall, Future Healthcare 2019 was a thoroughly exciting event. It is always exciting being party to the cutting edge of medical innovation. After 15 years of development and more than 200 flights, an Israel firm is confident its autonomous flying ambulance will be ready to hit the market by 2020 – and will come with a $14 million price tag. The Cormorant, formally known as the 'AirMule', can transport about a half a ton (500kg) of weight at 115 miles (185 km) per hour. 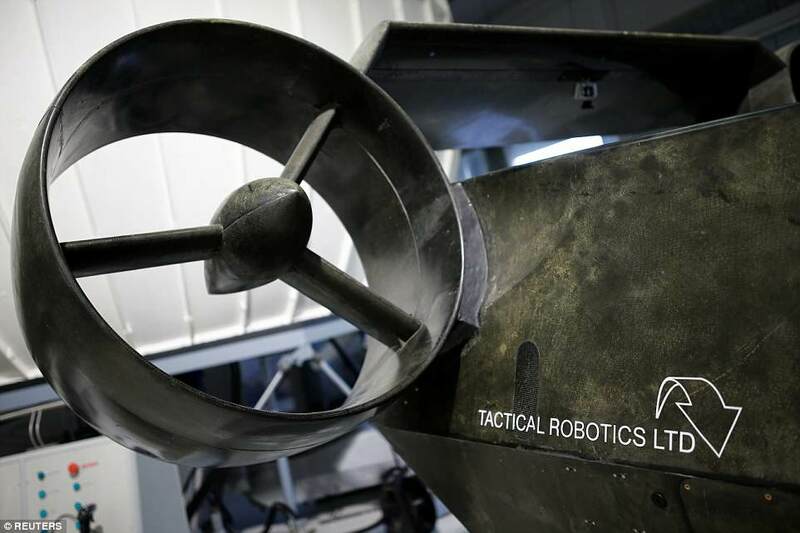 Designed by Urban Aeronautics, its developers say the military drone will be able to reach areas unfit for helicopters to deliver supplies and carry wounded soldiers to safety. 'Just imagine a dirty bomb in a city and chemical substance of something else and this vehicle can come in robotically, remotely piloted, come into a street and decontaminate an area,' Urban Aeronautics founder and CEO Rafi Yoeli told Reuters. Although the firm has set 2020 for its release date, they say there is still plenty of work required before the autonomous vehicle hits the market. The Cormorant made its first solo flight over terrain in November, but during test, the team found small issues with conflicting data sent by on board sensors. Regardless, industry experts say this technology could say lives. 'It could revolutionize several aspects of warfare, including medical evacuation of soldiers on the battlefield,' said Tal Inbar, head of the UAV research center at Israel's Fisher Institute for Air and Space Strategic Studies. The Cormorant's sole purpose is to transport troops, civilian passengers or supplies within tight quarters where helicopters are unable to travel. The test flight, which was carried out on November 3, was the first time the Cormorant took to the skies over uneven terrain while piloting itself. 'The challenge in designing and testing an FMS for a configuration that is has never been addressed by standard flight control algorithms, is analogous to a novice pilot attempting to fly for the first time with an understanding of basic aerodynamic principles but no instructor,' explained Urban Aeronautics. During the test flight, Cormorant's FMS corrected itself in response to unexpected events. For More Information about Air Ambulance Booking and Planning - Call us or Email us.